A Voice Level Indicator to help you get your volume just right. 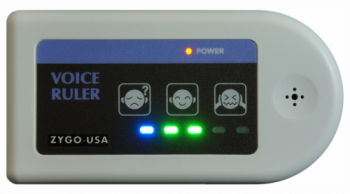 The Voice Ruler is a new concept device that visually displays a person’s voice output level. The unit’s internal microphone detects a person’s voice and displays its loudness with a 5-level multi-color LED display and easy to understand face icons. For normal everyday conversation, the BLUE light means the voice is hard to hear, the RED light means the voice level is too loud so it might disturb other people, and the GREEN light means the voice level is just right! 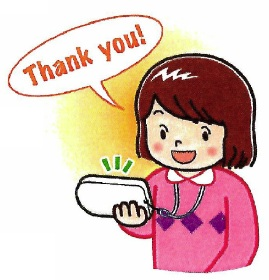 According to the inventor, Tomonori Karita, associate professor of the Faculty of Education, Ehime University, children with learning problems can have difficulty adjusting their vocal levels to their surroundings in classrooms or vehicles. As this can lead to them being bullied or withdrawing socially, it is considered better for them to learn control of their voices at as early an age as possible. With this device, children can practice anytime and anywhere on their own without a teacher nearby. 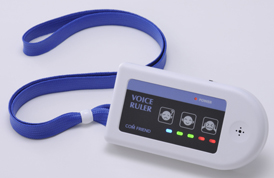 An improvement in their learning level also can be expected since the Voice Ruler gives a constant, objective measurement and assessment. Turn on the Voice Ruler with the slide switch. Open the desk stand on the back of the unit. Place the Voice Ruler on a flat surface in front of you so you can see the front panel. Speak in a natural voice and in a comfortable sound level. If only the BLUE light comes on, speak a little louder. If the RED lights come on, you are talking too loudly and need to lower your voice. And when the GREEN lights are on, you are talking at an acceptable level. The display range can be three or five levels of measurement and can be set on the device, although it is done inside the back cover. There are two icons available for the loudest level.